Union Pacific engine 1989, which is a commerative unit honring former Denver and Rio Grande Western leads the Ski Train up the Front Range. 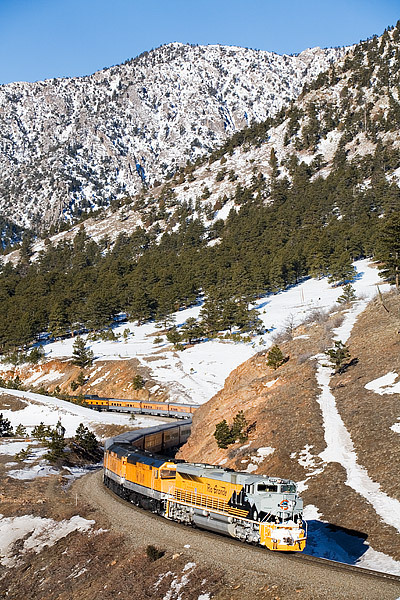 Though Union Pacific owns the rails the Ski Train travels along between Denver and Winter Park, Denver and Rio Grande ties are still strongly rooted in the Ski Train tradition. The Ski Train is seen rounding the curve just outside of Tunnel 1 as it continues its ascent towards the Winter Park Ski area. Photo © copyright by Thomas Mangan.